Manila clams are tasty bivalves that are classically prepared in pasta and soups. But where do these shellfish hail from, and what are some tips for picking and preparing them for the best result? Here's everything you need to know about Manila clams. Where Do Manila Clams Come From? In North America, Manila clams are found from British Columbia in Canada to Northern California. But they're not native to the area. Manila clams were accidentally introduced in Washington state in the 1920s in shipments of oyster seed from Japan. Today, Manilas are widely—and sustainably—farmed in the Pacific Northwest, mostly in Washington state and British Columbia. Unlike some kinds of fish farming, clam farming poses little threat to the environment because the clams are hatched in pens and then live their lives in the wild. Of all the clams you can buy, Manila clams are the sweetest and probably the smallest hard-shell clams you will find at the market. Their flavor is what makes Manilas a favorite of many professional chefs. Manila clams are easily spotted by their attractive shells and small size. They sport deep, wide bars of color over a finely ridged shell that makes them distinctive. And while Manila clams can live for seven to 10 years and grow to eight inches across, most are sold at three to four years old when they are typically less than three inches across. In the wild, Manila clams live alongside Pacific Littleneck clams, which are not to be confused with the Eastern Littleneck clam. Even though they may seem similar, it's important not to mix the different types of clams in the same dish, unless you cook them separately. 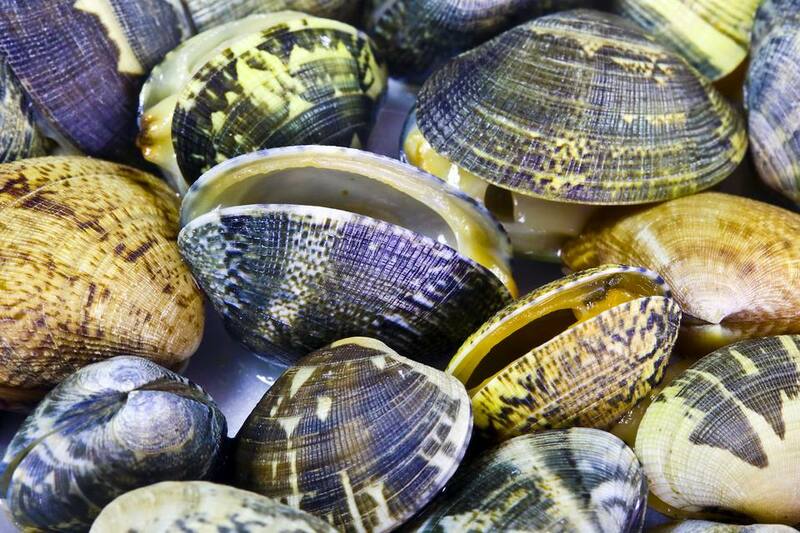 Manila clams need only about three to five minutes to steam open, while Pacific Littlenecks require 10 to 12 minutes. From a cooking standpoint, most Manila clams are steamed. You can certainly eat them on the half shell, but for some reason, few people do. They taste every bit as sweet as the Eastern quahogs that are commonly eaten on the half shell, but Manila clams are less salty. As a rule, pair Manilas with some cured pork, such as bacon, pancetta, chorizo or something else that's cured and salty. If you want to mix them with another seafood, try crabs, Pacific perch, or flounder. Why? All three eat Manila clams in the wild, and they share a connection on the plate because of this. One great perk is that Manila clams won't break the bank. They are typically sold by the pound, and one dozen Manila clams is a healthy main-course portion for one person. Personally? Because of their size, many people may find they can eat more than a dozen. If you're serving a crowd, it is always better to have too many than too little, so as a general rule, consider purchasing a dozen for each person you will be cooking for, then an extra dozen for good measure. One note of caution: Any clams that did not open their shells after steaming should be tossed. It's likely they died before you purchased them and can make you sick if you eat them.